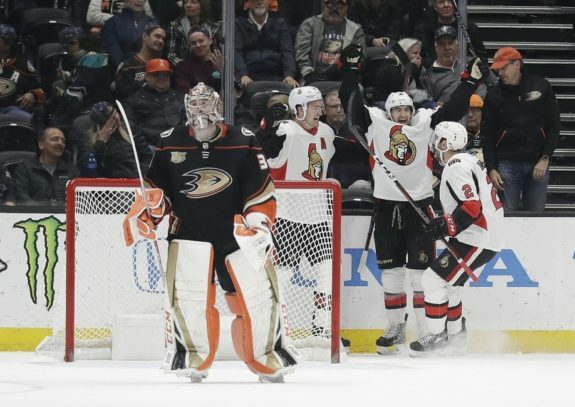 ANAHEIM, Calif. — Colin White scored at 1:34 of overtime and the Ottawa Senators snapped an eight-game losing streak by rallying for a 2-1 victory over the reeling Anaheim Ducks on Wednesday night. NOTES: Anaheim C Rickard Rakell returned to the lineup after missing 13 games due to an ankle sprain. … Ottawa C Matt Duchene is not on the road trip as he and his wife, Ashley, await the birth of the couple’s first child. Duchene is second on the team with 43 points and has six goals and two assists in his past eight games. … DeMelo, who assisted on Ryan’s goal, has an assist in three straight games. … Anaheim had five shots on goal in the first period, marking the sixth time this season the Ducks have had five or fewer in the opening period. Ducks: Host the Pittsburgh Penguins on Friday night to conclude a six-game homestand.